The electric fan allows the exhaust of toxic vapours generated inside your safety cabinet. The vapours are purified by the active coal filter and rejected without danger in the atmosphere. 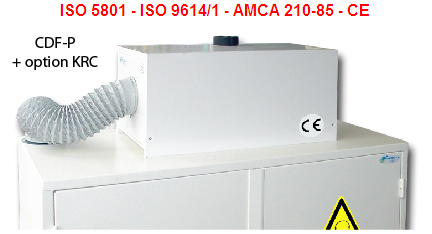 Electric fan in compliance with ISO 5801, 9614/1, AMCA 210-85; 0 marking. Electric fan in compliance with ATEX norm on request. Please contact us. No modification of building's structure required. Active coal filter type « candle » H150 X Ø 150mm (CDFF15 model) must be changed at least once a year. Filter settled on the box by 3 lugs and airtightness insured thanks to a rubber seal. - Exhaust intlet Ø 100 mm / outlet Ø 75 mm.